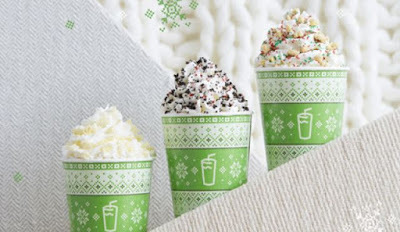 Shake Shack gets festive with the introduction of a new trio of holiday shakes. - Christmas Cookie (returning) - Sugar cookie frozen custard topped with whipped cream, crumbled shortbread, and red and green sprinkles. - White Mocha - White chocolate coffee frozen custard topped with whipped cream and white chocolate curls.